Celebrate those wonderful moments on stage dancing her heart out with the dance recital frame personalized Christmas ornament! Beautifully designed and pretty as can be, these frame ornaments personalized by hand include a support leg attachment for display on any flat surface. They become family treasures with the addition of a beautiful shot of her in mid jump or doing her very best pirouette. A lettering pro will use a beautiful hand-painted font to add the information you provide, and there's room for a longer message on back, if you choose that option. 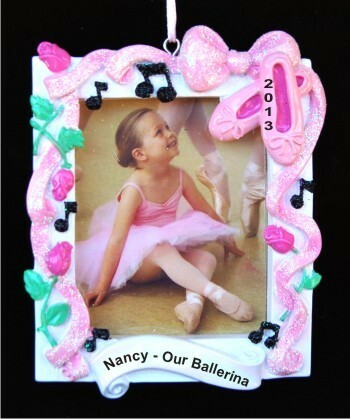 Capture memories you'll cherish forever with the pink ballet recital photo frame Christmas ornament personalized just for her and arriving in our plush velvet gift and storage bag.